Caz’s son Jesse is obsessed with Pirates. In particular the movie “Pirates of the Carribean’. He lay-byed this ship from the movie himself and then paid it off with his pocket money (which at $2 a week took quite a while) so it is one of his most prized possessions. 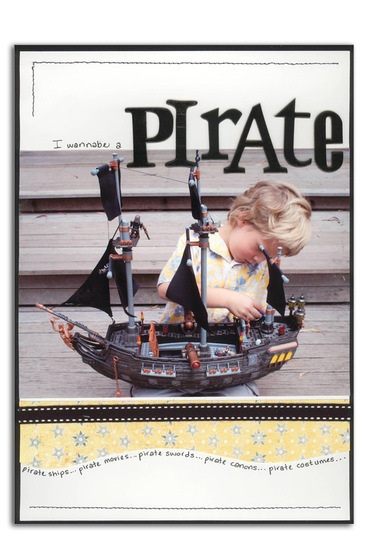 He spends hours on end, playing with his pirates, dressing up as one, drawing intricate ships with lots of rigging and pirates on them and watching the movies over and over again. It is definitely his biggest hobby. Caz kept the layout simple to showcase the photo. The title is from Heidi Swapp. The patterned paper from Basic Grey and the stitched ribbon is by Strano Designs, this months onsert sponsors. 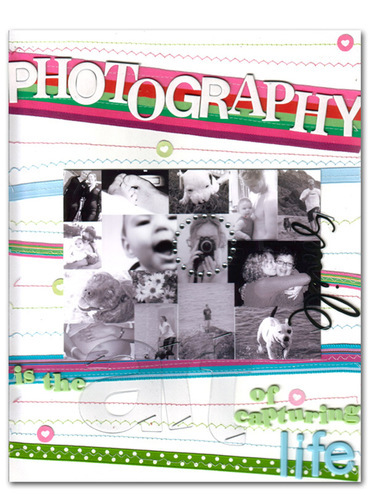 Since becoming a scrapbooker 4 years ago photography has become a hobby of Marni's. So for this her first in the last series of Everyday Moments layouts she has decided to dedicate it to the art of photography. Marni used Photoshop Elements to create a montage of some photos she has taken over the last 12 months. 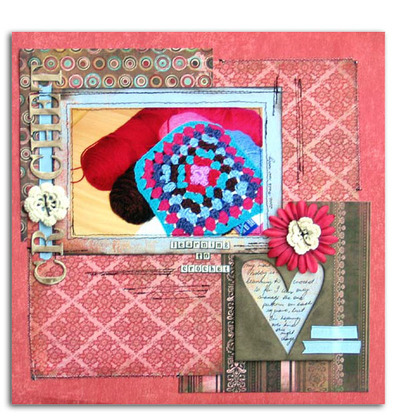 She used Strano Designs ribbon and machine stitching to create her own patterned background. As well as this she also used a Heidi Swapp bling frame to draw your attention to an important photo. To finish the layout off Marni used a combination of Heidi Swapp alphabets to create her title. This photo was taken at the scrapbooking convention last August of Rach by a friend. 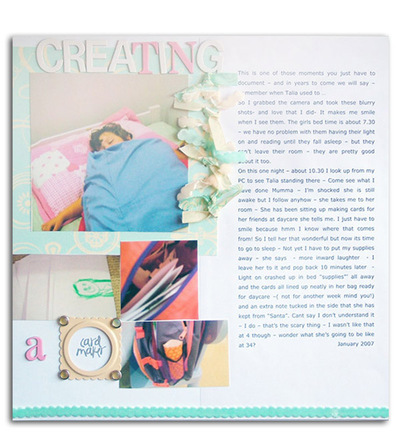 She loves the photo and it sums up how great the hobby of scrapbooking is! It is more than just sticking photos on paper and telling her story, it is getting the opportunity to catch up with friends, make new ones, laugh, share, work together and have fun. 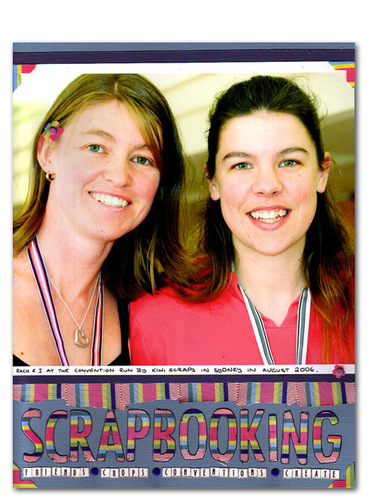 At the time Rach was working in Canberra and her good friend and boss Cheryl gave her these Strano Lanyards, so Rach decided to go all Strano out on the page, using a new product from Strano that allows you to die cut ribbon with no fray!! It is awesome and she created flowers, photo corners and letters using her Quickutz. Keep your eyes on your local store, this stuff will change the way you use ribbon, its amazing! This is one of those moments you just have to document – and in years to come we will say – Remember when Talia used to … Its all about how one night she stayed up till 10.30 creating cards for her friends at daycare - The photos are blurry taken late at night but Tamar couldnt resist and it was an everyday moment that she really loves to scrap about. SEI- chalk background is perfect for lots of colour and by making the ribbon border around the main photo Tamar has placed the emphasis on her daughter who the story is about - The Lil Davis flock ribbons are lovely to work with! Crocheting is one of Mel's new hobbies that she is trying to master. For this page she selected the Basic Grey Blush patterned papers, the chocolate tones of the papers to help pick up the chocolate wool in the photo. Mel has used the Strano onsert provided and added one strip of the ribbon under the title and a small splash of ribbon next to her journaling.